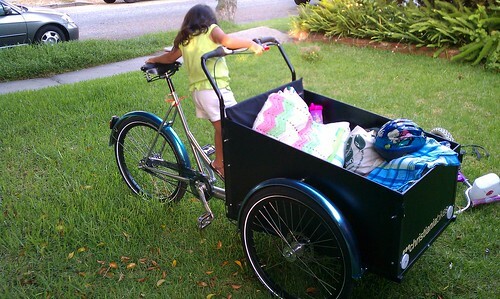 Flying Pigeon LA road tested this Christiania cargo trike and let a kid crawl all over it. The result of our scientific survey? The bike is rad. Everyone should buy one. We sell two versions: one is a supreme baby carrier with a padded bench, a carriage cover, a rear wheel lock, and a dynamo light set built into an aluminum frame; the other is cargo hauler with a box with a bench mounted to a super tough steel frame. The baby carrier is $2,799. The cargo hauler is $2,599. Shipping is a mother, but we do deliver these in the LA area for free. With these tricycles, you can start a home-based business or ride your kids everywhere – or both!